"That is not what sees everything, but what sees a little bit, which is what "Oligos" means in Greek. For instance what is interesting, and we have in our book lots of these examples, is a series of pictures on the Meteo, the French Meteorological Organisation around Paris. Now what is amusing is that what we see from the office here is not the weather. We see just a little bit of the weather, much less than what we see when we look at the map, which is published and printed by the machine; a little more when we get at the instruments, which are in the garden. Now what is interesting in the notion of Oligopticon is that when you get outside, what you see outside your office is nothing. You start to begin to see something just by looking on the screen of your computer. It’s a reverse of Plato’s Cave Myth. In Plato’s Cave Myth you had to get outside of a cave in order to see anything. Nowadays when you go outside, you see less and certainly not the weather of France as a region. 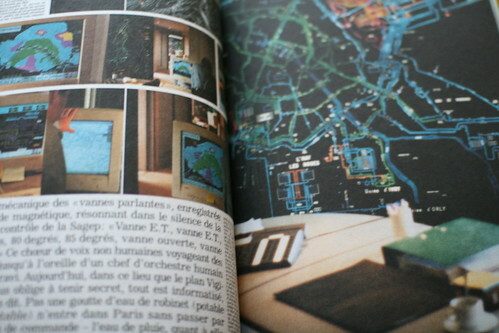 (...) it’s an Oligopticon which is in the middle of a prefecture of Paris surveying the whole of Paris activity. (...) Cables of information here. The water and the information are actually connected to it. In a big Virtual Society synopticon you can see the whole of the water of the Montmartre region going on and up. Now if you multiply all the sites inside a City like Paris, which gather, which accumulates the mass, the whole of Paris under one little auspice, under one little line - water, gas, electricity, telephone, peripherique, circulation, police etc, you end up re-localising this notion of Society that has escaped us for so long, before the computer"
And in "Paris ville invisible": "As big as the oligopticons visited in our inquiry may be, they occupy only a few square metres, and if they spread everywhere, it's only through very fine cables that the slightest trench dug in the ground for the flimsiest motive". Why do I blog this? Being interested in spatial representation of different sorts of phenomena (call them social or the flows of people in building/cities), it's interesting to trace this notion back in time and see the considerations someone like Latour discusses about it. There is lot to draw from both the book and this conference verbatim. The re-localization of the (very Latourian notion of the) "social" is intriguing as it offers an opportunity to grasp and make explicit group behavior; some would argue that it even allows to investigate individual behavior, which I am not sure about. Moreover, beyond the reference to Plato, it's important to discuss the implications this sort of device has for the way we experience the world (in/out the cavern) and that the expansion of our perception of the world limit are different than it used to be. Also, it's not very present in the quotes but the notion of localization of power (who have access to these date? who acts upon them?) is of considerable importance in a world where these dataflows are ubiquitous.